Janet Napolitano, president of the University of California system, speaks at the first panel of the Reagan Institute Summit on Education on Thursday. If “A Nation at Risk,” the landmark report that launched the modern education reform movement 35 years ago, came out today, it would get a far different — and more polarized — reception, education leaders said Thursday. 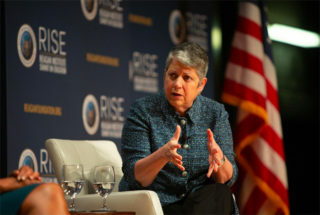 “Each [political party] would take different lessons or have different prescriptions, when in fact, what we need is a national unity of effort that’s effectuated at the local level,” said Janet Napolitano, the former Homeland Security secretary and current president of the University of California system. Napolitano spoke with former Secretary of State Condoleezza Rice at the first panel of the Reagan Institute Summit on Education, a daylong event celebrating the anniversary of “A Nation at Risk.” Romy Drucker, co-founder and CEO of The 74, moderated the discussion. Americans aren’t connected by ethnicity, religion or blood, but rather by the idea that with hard work anyone can rise up and achieve his or her potential, and education is a key to underpinning that, said Rice, the Denning Professor in Global Business and the Economy at the Stanford Graduate School of Business and a professor of Political Science at Stanford University. “A democracy won’t survive very long if it’s so fractured that you can’t come together around common purposes,” she said. The American democracy is increasingly cracked, with people retreating to partisan corners for media and thinking those who disagree are “stupid or banal,” Rice said. Keys to ensuring improvements in education and a stronger democracy include getting political leaders to put more energy into education and explaining to the American people the importance of education for all kids — not just their own, Rice and Napolitano said. And, they added, it’s essential to challenge young people to break through that political polarization. “It is a real challenge in this time to really educate young people in that way and to foster that sense of civic engagement,” Napolitano said. The country must understand that the very idea of American democracy is at risk because of political polarization, she said. “One of the central parts of resolving that is to make sure our young people can reach their full potential through getting a quality education, whatever their passions are,” she said.